On August 5, Golden Year 6 (2009), our Association members from Surrey traveled to Leeds in West Yorkshire, UK, to present the Shining World Inventor Award to Ms. Emily Cummins, a third-year Business Management university student. The Award was bestowed by Supreme Master Ching Hai for Emily’s life-changing invention, the solar powered fridge, an appliance that can be used to assist those in developing nations and for transporting medicines in hotter regions. Emily has won many accolades for her inventions and by chance, at a conference to receive one of those awards, she heard a powerful speech about the effects of climate change. Following that, she immediately went to work and developed the solar powered fridge, which can cool itself like the human body after sweating and can be constructed using local materials. Traveling to many places in southern Africa, Emily tested her design and showed others how to build it. She said, “I have encouraged people to start their own businesses. So, instead of me or some large organization taking every small amount of money you would make from one of these fridges, it has given people the opportunity to create their own jobs, which to me is the best feeling of all.” Emily now speaks at many educational institutions, conferences and affairs, and is an ambassador for Speakeasy4schools, an organization which runs enterprise events in academic establishments across the UK. 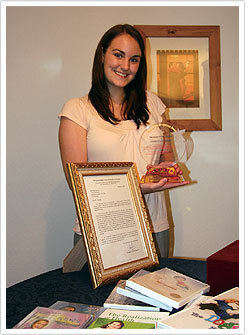 Upon receiving the beautiful crystal Award plaque, Emily said it is now her favorite of all her awards. She was also delighted to receive Master’s best-selling books and other publications. Our best wishes to you, Ms. Emily Cummins. May heaven continue to bless you and all your noble endeavors that enhance the lives of others.